Trump has made a point of courting private-sector unions, especially in the construction trades where he built his own company. He boasted about his longstanding ties to the industry at the 2017 conference for North America's Building Trades Union—a collection of more than a dozen construction labor groups under the AFL-CIO umbrella. Despite his wooing, the Building Trades Union spent $42 million on the 2018 elections with $40 million going to aid Democratic candidates, according to the Center for Responsive Politics. Industrial unions spent $10,115,261 on the elections—only $2,745 has gone to conservative candidates or groups. Republican candidates generally win about 40 percent of union households, but President Trump outperformed past GOP nominees among working class voters. Unions, however, have not changed their political spending habits and continue to direct nearly all of their political donations to Democrats and liberal candidates. Labor watchdog Richard Berman of the Center for Union Facts said the 2018 spending comes as no surprise, pointing to the estimated $1.3 billion labor groups have given to liberal causes and candidates between 2010 and 2017. 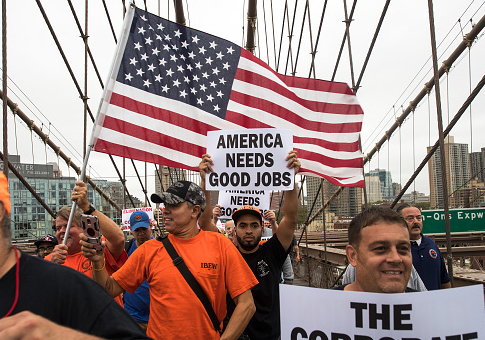 "For far too long unions have gotten away with using membership dues to advance a left-wing political agenda—without any prior approval from workers," Berman said. "Though the Court's recent decision in Janus has started to turn the tide on unapproved political spending for unionized government employees, private-sector employees are still subject to unions hijacking dues money for politics." Outside spending has taken center stage in political finance since the Supreme Court began allowing limitless corporate and union involvement in federal races in its 2009 Citizens United ruling. Outside groups have already spent $342 million on the 2018 election as of September compared with the $222.5 million spent during the entire 2014 midterm election cycle. The National Education Association, American Federation of Teachers, Operating Engineers union, American Federation of State, County, & Municipal Employees, Communications Workers of America, United Steel Workers, American Federation of Government Employees, Service Employees International Union, United Food & Commercial Workers Union, and the International Brotherhood of Electrical Workers were all among the 25 biggest spenders in campaign activity. Each union has criticized the Supreme Court for allowing greater outside spending and giving third party groups like companies and labor unions the ability to directly aid political campaigns. Only four unions gave any money to conservative candidates. Only 1 of the 12 unions responded to requests for comment from the Washington Free Beacon about outside spending and broader questions about union political activities in the post-Trump world. A spokesman for the American Federation of Teachers said the union had complied with all disclosure laws but declined to elaborate on the nature or strategy behind its spending. This entry was posted in Politics and tagged 2018 Election, Big Labor, Unions. Bookmark the permalink.